You know that in our culture there is a lot of racial prejudice; this needs to be examined and changed. God created all of us, and we all have red blood. One race = The Human race! Here are some encouraging scriptures about prejudice. 1 hour 24 minutes Slavery By Another Name – YouTube. 11 minutes Dr. Joy Degruy On Empathy for Black People in America – YouTube. Racial prejudice has been passed down, but needs to be looked at for what it is, sin! Prejudice Does Not Serve Any Good Purpose! If you have a racial prejudice against any race, I pray that you will be willing to let it go! Although because of our sinful nature and also because of fear and the way our parents have brought us up and influence via the media, false pre-judgments have gotten into each one of our life to some degree. I am saying that it does not have to continue! God has given us knowledge and wisdom to overcome racial prejudice, and the Holy Spirit can change your life because of God’s word in the Bible. Prejudice Is Not Something God Wants! I want to share with you that there is only one race, (the human race). There are many ethics groups within the human race. We are all brothers and sisters who all came from the same Father. Are there references to racism in the Bible? Does the Bible say anything about diversity? How did the origin of the different races begin? Do You Have A Racial Prejudice In Your Heart? “Do I treat other races (or talk about them) negatively? Perhaps through your church or a friend, get to know someone of a different race. If you are white, make friends with a black person. If you are black, make friends with a white person. As you pursue this challenge, you will see the other person as a potential friend, not someone to be afraid of. Martin Luther King Preaches The Importance Of Love!!! Do You Want To Hear What He Has to Say? Click Here! Do You Have Racial Prejudice In Your Heart? Get to know about their family and religious values. Learn about some of the racial experiences they lived through while growing up. Ask them to clarify any prejudices that they might have picked up during their life. Ask them if you could pray for them in any specific way. Share with them about yourself on a deeper level (some of the same topics above). Treat them as you would treat any other friend or acquaintance. Try to keep good eye contact, acknowledging what the other person is sharing with you. Thank them for sharing and being willing to start this new friendship with you. Who Are More In Favor Of Racial Prejudice? What are some specific practical ways we can love one another, especially if someone is different ethnically, politically, spiritually, or any other way than us? Ask questions about them, rather than start by talking about myself. Love one another warmly as Christians, and be eager to show respect for one another. Spend time with them, listen to their heart and pray for and with them. Try to love people in my strength or allow Jesus to love people through me. Ask how I can pray for them. Take time to listen. Am I branching out intentionally to be with others different than ourselves. 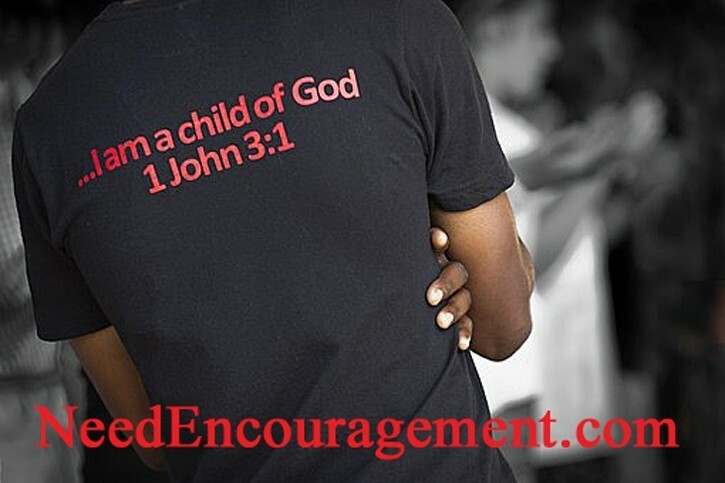 Treat each person we encounter as if we were greeting Jesus Christ! Sitting with someone, dining with them, hearing their story. Ask God to help us to love them unconditionally as He loves me! The big thing is to start getting to know some people of that race that you haven’t ever gotten to know. God created us as brothers and sisters in Christ; we need to remember that. God changes hearts. Pray for your bias you may have because God answers the prayers of the righteous. No Favoritism And No Prejudice! There Is No Place In Our Life For Prejudice! 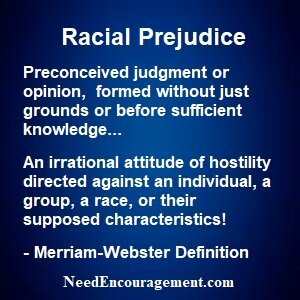 Racial prejudice is when you are prejudiced against someone because of the color of their skin or their race. Racial bias is sometimes very subtle, yet those who are being discriminated against can sense the discrimination. The best place to start is with ourselves. If you have prayed for your heart to change, you will notice a difference! You will see that God created all people equal, no matter what color of skin. Thank God for your change of heart, and share what you have learned with others. You are not the only person with a racial bias. Racial problems are common in the United States. We are all wired with some bias or prejudice at one time or another because of our sin nature. I was raised in an entirely white neighborhood. I didn’t know a black person personally until I was a freshman at Pius XI high school and met my first black friend, Clifford Walker. Clifford and I talked deeper than just talking about our favorite sports teams. We grew and learned from one another. Clifford and I both played on the same basketball team and our common denominator, was just that, basketball. After a couple of years on the same team, we both knew our skin color was different, but we had the same color blood. Yes, Clifford was raised differently than I was, but that is just par for the course with any relationship. We knew that our goal on the basketball court was the same, to win the conference championship—and we quickly learned that we could win the title if we focused on what we had in common instead of how we were different. Meeting the starting guard Clifford and getting to know him, was the very best way to get rid of lies I heard about black people back in 1975. Martin Luther King Didn’t Give Up On His Dream! Cedric D Hoard Went to High school With My Son Chris, And Cedric Has Something to Say About Racial Prejudice. What Is My Point in Discussing Racial Prejudice? Do not settle for any degree of prejudice in your life. Racial bias can become hideous, even to the point of violence or death. Think about the phrase, “People Are People.” People are who they are and who they choose to be. Emotions can easily sway those without a moral compass, those who are not using their intellect. There are countless “good white people, ” and there are countless “good black people.” It would be foolish to say that because one man once said terrible things to someone whose feelings were hurt, that ALL people of that race will say bad things to this person or others, hurting their feelings. That would be utterly foolish, irrational, and wrong.